After 2,109 days, Chip Kelly won a college football game. 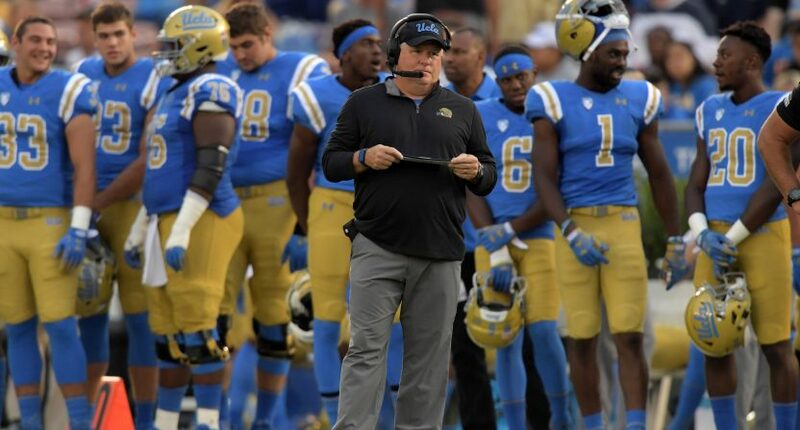 On Saturday, Kelly picked up his first win as head coach of UCLA when the Bruins dominated California on the road, 37-7. It was a long time coming for Kelly, and now he can finally start looking forward to what’s next for the Bruins. A week after hanging around against Washington (the current gold standard in the Pac-12 despite dropping their second game of the year earlier in the day), UCLA was due for a win. And even though Cal had been showing some promise this season, the young Bruins and Kelly were ready to finally break away from the ranks of the winless teams in the country. And what better way to do just that than by putting up 17 points in the fourth quarter to slam the door shut on their opponent for a 30-point win? Kelly trusted running back Joshua Kelley to lead the offense. The junior rushed for a game-high 157 yards and three touchdowns. UCLA’s defense also turned in a solid effort by holding Cal to three third-down conversions on 14 attempts, and Cal had five turnovers in the game. UCLA had none. If UCLA’s first win had to be aided by one of the worst showings by Cal this season, then Kelly and the Bruins would gladly accept it. The best news for UCLA is they found a way to capitalize on those giveaways by scoring 17 points off Cal turnovers. The last time Kelly won a game as a college football coach was January 3, 2013 in the Fiesta Bowl against Kansas State. A lot has changed for Kelly in that time. He’s coached for two different NFL teams and worked a season as an analyst for ESPN, Washington has become the top Pac-12 threat, Oregon is on their second coach since Kelly, USC is no longer on sanctions, and Alabama is a national title contender. Okay, so some things have been more consistent than others. But it was a long time coming for Kelly. UCLA started the season with a sense of optimism about the future of the program as Kelly returned to the conference he once dominated while at Oregon. So where does UCLA go from here? Getting to a bowl game is still likely out of reach with games still to play against Utah, Oregon, USC, and Stanford, but the point of emphasis now becomes just continuing to build the foundation and establish a winning feeling. There may not be many wins left out there for UCLA this year, but now that the team knows what a win feels like, Kelly and his staff can begin to build off that feeling.